I've wanted this stamp for a while so when Hobby Lobby had their stamps 50% off, I just had to get it! I used a SCS sketch, SC208. I also used some wonderful new paper, Dovecraft Retro Floral. Love this paper...so yummy!! 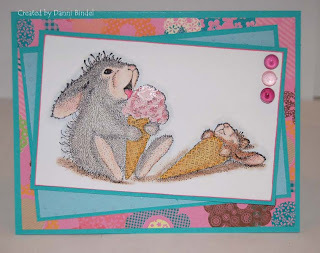 I also realized as I was making this card that it works for the House Mouse Monday Challenge #19 which is embossing. Forgive the last photo, the stickles weren't dry so I had to hold the card up. Plus I messed up the ice cream cone......I think it still turned out okay though. Love it, so darn cute! This is so adorable! I wouldn't have been able to resist this stamp either! 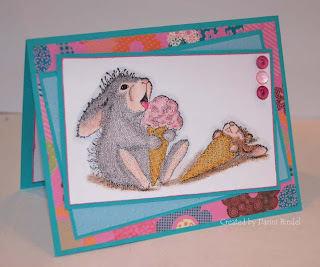 Love the glittery icecream cone and colors! LOVE it! Love that image. Your coloring is fantastic and I love the paper. 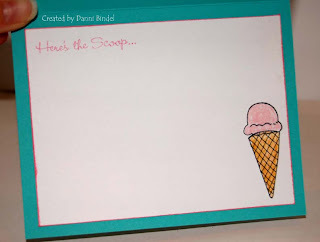 So cute and I love the bright colours...that's how I think of ice cream! What a darling card and love the image! When I finish my flutter by card for next week do I e-mail it to you? Ha, I love it! So cute, great colors too. Super cute! You've really been busy - congrats on going over 10,000 hits on your blog! Such a cutie-pie image---makes me giggle! Love how you colored them too! Great Colors Danni!! I really like that DSP again and your coloring is great!